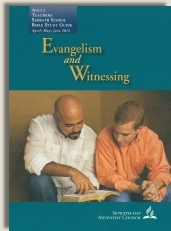 Commentary on "Evaluating Witnessing and Evangelism"
Day 2: Sunday, June 17, 2012 - Why Evaluate? Read again 2 Cor. 13:5. What does the text say to you personally? How can you apply this to yourself? What evidence do you have that “Jesus Christ is in you”? The early Christians, despite their lack of academic learning and hierarchical organizations, turned the world upside-down. Their emphasis was on God’s work, not on some formula for evangelistic success. Jesus Christ is the power of the Holy Spirit so that men come to put their faith in God through Him, to receive Him as their personal Savior. The elders trained the saints to evangelize and reach out to a lost world. They went, they spoke, and the Lord added to His church. The verses following the first question are all basically summed up to point us to personal examination and evaluation. Before we can go out and be effective for God’s work and glory, we need to look at our own hearts and see if they are right before God. It’s about our character—do we possess humility? What are our motives—the advancing of God’s kingdom, or praise and recognition from others about our personal accomplishments and contributions? Are we willing to perform “menial” tasks, or do we want what we feel are the important jobs so that we can feel superior? When considering the second question (including “What is God’s evaluative process?”), it really comes down to two things: 1) Do we have a humble and willing heart ready to be used in submission to God’s will, no matter what that entails? 2) Are we preaching the correct gospel? The Bible is pretty clear that getting the gospel message right is of utmost importance. If we err in this point, the rest is meaningless. • Their goal of evangelism is to increase the membership of the Seventh-day Adventist church, not to make Christ-followers. They are not the same thing. They hold the false doctrine of The Investigative Judgment, asserting that Jesus’ atonement and sacrifice on the cross wasn’t complete (fundamental belief #23). They consider themselves to be the “remnant church” and that all other churches are deceived (fundamental belief #13 and 18). 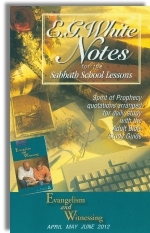 These are just a small sampling of unscriptural doctrines held by the Seventh-day Adventist church. In looking briefly at the final question given, I just want to emphasize one main point: That we can know that Jesus lives in us. As I mentioned earlier, when we accept Christ, we are sealed with the Holy Spirit (Eph. 1:13, 14; 2 Cor. 1:22). Philippians 1:6 says, “I am sure of this, that He who started a good work in you will carry it on to completion until the day of Christ Jesus.” He is on our side and won’t leave us alone. Period. It is Christ who carries it on to completion, not us. Because we have this amazing grace, love and freedom in Christ, our response will be to produce fruit—not works for salvation—for the kingdom and for His glory. This is the work of Christ in me, not of my own volition or efforts. Like the early Christians, we need to go, speak, and the Lord will add to His church. Our emphasis should always be on the work of God and preaching a correct gospel. Personal examination is important. If our motives and heart are askew, then God can’t work through us for His glory. Seventh-day Adventists preach a false gospel. Many of their doctrines and beliefs are in direct contradiction to the Bible. Copyright 2012 BibleStudiesForAdventists.com. All rights reserved. Revised June 1, 2012. This website is published by Life Assurance Ministries, Camp Verde, Arizona, USA, the publisher of Proclamation! Magazine. Contact email: BibleStudiesForAdventists@gmail.com.